I thought for quite some time about whether or not to share this post today. Blogging a recipe while my friends and loved ones in Northern California are facing devastating wildfires gave me pause. But one thing I learned while caring for my father during his fight with terminal cancer was that during catastrophic events, the minutiae of daily life are lost and dearly missed—I longed for life's trivial moments that had disappeared. My heart is broken for those impacted by the fires, but my heart is warmed by the outpouring of love and support from the community (not to mention the amazing fire fighters). Everyone I know is helping to rescue people and animals, opening their homes to and caring for those who have been evacuated, and providing provisions and necessities. Many chef friends are holding fundraisers and cooking for those displaced by the fires as well. Food is more than sustenance for our bodies—it sustains our souls as well. I hope this blog provides at least a brief distraction, and a little glimpse back into daily life. And I hope that this recipe makes its way into ovens to provide comfort and sustenance for friends who could use some TLC. Love to you all. One of my favorite things is growing ingredients and cooking meals for friends and family. Feeding the people for whom we care greatly is one of life's most basic and rewarding activities, and being able to grow the ingredients adds even more love. Piping hot, homemade desserts are particularly comforting—perhaps because we associate them with the holidays, with winter. But a summer dessert such as a fresh berry pie has the same effect. While I have grown all of our herbs and veggies from seed, we did inherit our rhubarb plant and apple and pear trees—the three ingredients from which I make most of my homegrown desserts. 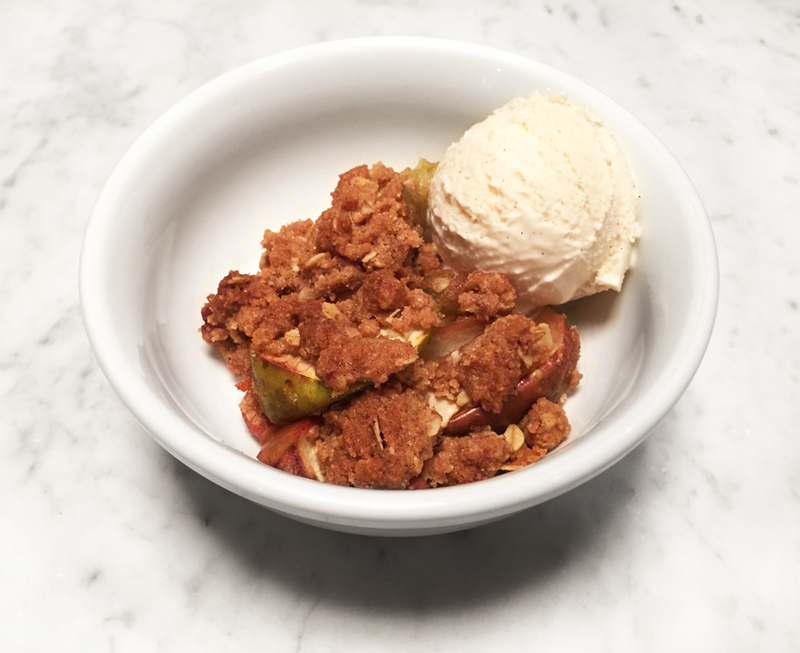 Rhubarb compote dominates the summer and fall, and apple crisp takes the leading role in winter. It likely wouldn't have occurred to me to plant them, but surprisingly they've become a big part of my culinary life. We had an oddly hot late summer and early autumn here in New England—the third week of September brought us highs of around 90 degrees. And then suddenly the leaves were on the ground. We hosted a dinner party on our first real autumn day, and I cooked a meal to suit the season: ginger carrot coconut soup, roasted pork tenderloin, seared radicchio and manchego polenta, followed by apple crisp. When I started eating gluten again I immediately called my mother and asked for her crisp recipe. I made it this summer, and admittedly strayed from its ingredients and instructions—I seemingly cannot follow a recipe without disobeying much of its advice—but Mama's crisp is still in there. As it was summer at the time, I used peaches and blueberries from a local farm instead of apples, but I made it again at my autumn dinner using apples from our orchard. This recipe can be adapted for any fruit of your choosing, and I've listed both a summer recipe with peaches and blueberries (or nectarines, strawberries, blackberries, raspberries, etc.) with almond extract, and an autumn recipe with apples and vanilla extract. You can't detect the extract, but it adds a certain something to the dish. I love oats and pecans in my crisp topping, but feel free to omit if you prefer a more traditional version (or use almonds or walnuts instead of pecans). Regardless, I hope you and your friends and family enjoy it. There's not much more comforting than a bubbling crisp hot out of the oven with a scoop of cold vanilla ice cream. And don't forget to sneak a bite of the topping. It's tradition. Preheat the oven to 375 degrees. Butter a large (about 2 quarts) glass or ceramic baking dish, and set aside. Prep the fruit: Add the fruit to a large bowl. Zest and juice the lemon into the bowl, and add a splash of extract (vanilla or almond) and pinch of fine sea salt. Toss to combine, and distribute the fruit evenly into your prepared baking dish. Prep the topping: Combine the whole wheat flour, sugars, cinnamon, nutmeg and remaining 1/2 teaspoon sea salt to the bowl of a food processor. Pulse to combine. Grab your butter from the fridge, and chop it into small chunks. Add it to your food processor and pulse to combine, but don't over mix—you want some buttery pockets. Add the topping to a medium bowl, and mix in the oats and chopped pecans with your hands, a rubber spatula or large spoon. Crumble the topping over the fruit (make sure most of it goes on the crisp, not into your mouth—it's tempting, I know. Bake until the fruit bubbles and the topping is golden, about 45-50 minutes. Serve hot out of the oven or at room temperature, with a scoop of vanilla ice cream. I distinctly remember my mother's poached pears from when I was a child. She cooked whole pears in red wine, and served them standing upright on pieces of country bread sautéed in butter. Over each pear she poured hot, red wine reduction that transformed the toast into an island in a shallow lake of deep red reduction, followed by a drizzle of cold, heavy cream. I remember cutting into the toast with my knife, and hearing the crunch of the crust—the middle was soft, drenched with red wine and cream, but the edges remained buttery and crisp. The taste was sweet, the red wine added contrast, and the rich cream rounded out the flavors. It was decadent. The thought of that dessert reminds me of the holidays, and my mom’s beautiful “special occasion” dessert china. And eating in the dining room, which we only ever did on Christmas when we had company. I loved her poached pears. But I have since learned that such delights need not be confined to Christmas, and that most decadent things have an adaptation that makes them suitable for the everyday. My poached pear recipe is just that—a version that makes for a quick and simple dessert. It’s particularly great for a dinner party when you already have enough balls to juggle without having to prepare dessert while your guests wait for you at the table. The pears and sauce can be made ahead and even stored in the fridge overnight. And the cardamom-infused red wine adds for a subtle nuance that compliments the sweet pears and ice cream perfectly. Bring the wine, honey, vanilla and cardamom pods to a boil. Meanwhile, halve the pears, trying to leave the stems intact. This may mean that half of the pear halves have stems, and the other half of the halves do not, or you could split the stems up the middle. Add the pears to the wine mixture and reduce the heat to a simmer. Cook for about 30 minutes, rotating the pear halves halfway through. Pierce a pear with a knife to test for doneness—once soft, remove the pears and set them on a plate to cool. Meanwhile, reduce the red wine mixture over low heat until it begins to thicken. Remove the cardamom pods and discard. Transfer to a small pitcher. To serve, add a scoop of vanilla ice cream to a bowl. Lean a pear half up against the ice cream and pour some of the reduced syrup over the top. Note: The pears and syrup can be made ahead and refrigerated overnight. Simply allow them to come to room temperature before serving. Or reheat the syrup on the stove as desired. Figs, Ricotta and Honey for dessert! Here's a photo I featured in the Foodstand newsletter. Excited by my weekly ingredient, I knew I wanted to include my favorite easy fig dessert in the newsletter: Figs, Ricotta and Honey. And coincidentally my future sister-in-law had just given the Man and me an engagement gift of honey- perfect timing! Ricotta and honey can be paired with many fruits to make a tasty dessert, such as assorted berries and/or stone fruit. (Tip: blueberries and peach slices with ricotta and honey make a great combo too.) But the fig pairing isn't to be missed. Like most ingredients, different ricottas vary greatly. It has been hard for me to find a sheep's milk ricotta that I really love back east (they tend to be too dry), so if you have a good recommendation, please let me know. But in California, Bellwether Farms' Sheep Ricotta cannot be beat. It is so silky and smooth with delicious flavor. And California has such amazing figs, so you West Coasters have no excuse. Actually, you East Coasters don't have any excuse either- get out there and enjoy the season! For the Foodstand recipe I used Kadota figs, but you can use any variety of fig you like. For a rundown on different fig varieties, feel free to visit the blog version of the Foodstand newsletter. And try the recipe below! If you can call it a recipe. It's really just assembly instructions. Sort of like Ikea but much simpler and doesn't involve a hex wrench or particle board. Split the ricotta between two bowls. Cut the stems off the figs, and slice the figs in half. Place three fig halves in each bowl, drizzle with honey to your heart's content, and enjoy! I posted a photograph of this tart on Instagram a couple of years ago, and have had many requests for the recipe. And since I'm on a dessert kick, and the weather is warm which means berries are back on the menu, now's the time to share it! I suppose strawberries were still available over the winter, but let's be honest- when they're not in season, berries just taste like water. Produce grows seasonally for a reason! Anyway, I modified this recipe from one I found online a number of years ago. Stuck pretty close to the original, but made some subtle tweaks that make a big difference. For me, fruit is the essential component to any summer desert. Sometimes it's as simple as serving berries or peaches with ricotta cheese and a drizzle of honey (yes! try it! ), fruit with ice cream or whipped cream, or macerating some fruit in sugar with mint... But sometimes I ditch my laziness and actually create a "real" dessert. So here's to summer with one of them "real" desserts. But I should point out... since the beautiful fresh strawberries are to pile on top, you could easily make the base of the tart, drizzle with chocolate sauce or a little ganache and a few toasted coconut flakes, and indulge in a winter version of this coconut-y dessert after this year's berry season comes to a close. It might help hold you over until next summer. Just saying. Grease 2- 4.5" mini springform pans with coconut oil, and set aside. Place the almonds and dates in the food processor, and combine until the mixture is fairly well-ground. Add the splash of vanilla and 2 pinches of salt, and pulse until evenly combined. Have your rubber spatula handy, and use it to scrape down the sides as needed. Divide evenly between the two pans, and spread the crust along the bottom and up the sides, pressing firmly. Place in the refridgerator. Blend the cashews and remaining 2 teaspoons of vanilla in your Vitamix or high-powered blender along with the remaining ingredients (except the berries...). Spatula the filling into the crusts, pile your strawberries on top, and refrigerate for a couple of hours. My mother makes a killer crisp. I remember walking into the kitchen and finding a hot crisp just out of the oven, sitting in a white casserole dish atop the stove. While I loved sitting down to a bowl of warm crisp with cold heavy cream, I think I preferred standing at the stove, slyly picking crispy pieces of topping out of the pan and sticking them in my mouth. And apparently so does the Man, as find myself constantly swatting his hand away. I'm turning into my mother. Which goes to show, a good crisp is all about the buttery topping. So making a vegan crisp that's worthwhile could be problematic, but this topping holds its own. Vegan versions of traditional desserts often drive me crazy. I have no desire to eat a mess of mealy chopped nuts and fruits that doesn't taste good, so in my book, a good vegan replica shouldn't be detectable as vegan. So far nobody has been able to tell the difference. Preheat the oven to 350 degrees. Grease a 9"x13" (3 quart) Pyrex baking dish with coconut oil. Set aside. In a large bowl, toss the peach slices with the lemon juice and thyme leaves. Spread evenly in the prepared baking dish. Combine the remaining ingredients in the food processor. Pulse until just combined, but not so much that the nuts are obliterated. Spread the topping over the peaches and bake uncovered for about 40 minutes, until the peaches are bubbling and the topping is golden brown. Serve warm, with a scoop of vanilla ice cream or a dollop of my (Coconut) Whipped Cream. My background is in straightforward food using simple, traditional methods and quality ingredients. Back to the basics. Meals driven by season, not by technology. People have been cooking amazing food with a pan and a fire for a long time. The sort of food you cook for a cozy dinner, or the kind you make for a meal outside on a warm summer day (like today!). You build your life by it, making wonderful memories with friends and family and lots of laughter around the table. Good food, good company, good life. So this is one of those sorts of recipes. And I revised it for a Rainforest Action Network event earlier this year. I both attended and catered the event, so I needed a desert that I could prepare ahead and assemble quickly without missing too much of the gathering. And being the beginning of spring, I wanted to welcome the new season with a warm-weather dessert. Plus, I love making granita because it's absurdly easy, and everyone is always impressed by the outcome. If you're making an herb-infused granita, the process is an expansion on making tea. It's pretty hard to mess up if you have a good timer. And that's the key- time, not just for the brewing, but also for the freezing process. Granita is a flavored ice, so you need to flavor the water and then freeze it. The nuances of the freezing process are what make granita nice and flaky, as opposed to a solid block of ice. It's all about the forking. (Yes, that's right.) After your granita mixture has been in the freezer for about an hour, you need to break up the ice crystals that have begun to form on the surface and edges. Fork it! Simply run the times of a fork through the mixture to break up the crystals, and return it to the freezer. By repeating this process every 30 minutes you achieve the desired texture. Yes, it will be a few hours before your granita has finished freezing, but all it takes is a couple of minutes of forking every half-hour to make it perfect. It keeps well in the freezer, so make it some night while you're at home doing laundry, cooking dinner and watching a movie. As my friend Jude would say, it's easy, peasy, (Meyer) lemon squeezy. Combine the the water and agave in a saucepan and bring to a simmer. Remove from the heat and add the whole mint leaves. Stir to submerge the leaves, and let steep for 30 minutes. Fish out the mint leaves with a sieve. Add the Meyer lemon zest and juice, pour into a shallow container, and stir. Place in the freezer for one hour. Remove from the freezer and run a fork through the mixture in order to flake the granita into crystals and prevent it from freezing into a solid block of ice. Return to the freezer, set your timer for 30 minutes, and fork the granita again when your timer goes off! Repeat every 30 minutes for a few hours, until frozen into flakes. Serve with a dollop of my (Coconut) Whipped Cream and a Marzipan Lace Cookie, as desired. The Man was supposed to go to Hawaii for an epic hike adventure with a friend from college a few weeks ago, but had to cancel last minute because he got sick. He and his friend take a yearly boy's trip dedicated to some sort of crazy athletic competition (read: attempt to hike crazy mountain to see who's faster, accidentally get hypothermia and descend in an epic blizzard), so he was seriously bummed about about having to stay home in bed and battle a sinus infection instead of a crazy climb (don't tell him I said that- I'm sure it would have been wildly successful). I felt really badly that he couldn't go. He has been working so hard and was looking forward to this trip for months. But we made the most of it, indulging in my latest obsession that is the Parenthood series on Netflix. And I baked cookies. And we ate half the batch in one night. Since my adventure at Turner Farms I've decided that maple syrup is the most flavorful sweetener, so naturally these are sweetened accordingly. I used coconut oil as well- the wonder fat. You really can use it for everything- as makeup remover, an intense lotion, hair cream... and cookies! And pecans are the Man's favorite, so those went in too. This recipe was the first of my test kitchen stay-at-home weekend baking project. The second recipe didn't go quite as well. The texture was so blah that I ended up putting them in the freezer, which did in fact help them tremendously. Actually, they were sort of tasty frozen, as are grapes. But that's a story for another day. Preheat the oven to 350 degrees. Add the dry ingredients to a large bowl and whisk to combine. Add the wet ingredients to a small bowl and whisk to combine. Pour the wet into the dry, and whisk to combine. Stir in the chocolate and nuts. Scoop batter by the spoonful onto a baking sheet, leaving a couple of inches between each ball of dough. Bake for 9-12 minutes until lightly golden. Let cool on your cookie sheet before serving. Honey isn't vegan. It's an animal product made by bees, which eliminates it from the vegan category by definition. Yet 'honey and veganism' is the subject of great debate, and some vegans eat honey as an exception to the rule. While I am not vegan (I eat fish, eggs, sheep and goat milk products, and honey! ), I do cook many vegan dishes, particularly on the dessert front. Since milk, cream, and/or butter are in practically all desserts, and I can't eat cow dairy, I accept that eating something sweet after my meal in restaurants is not an option for me (unless of course there's a sorbet). So I make desserts myself! And while my dessert recipes are largely vegan, some of them do contain honey, such as my Marzipan Lace Cookies. So if you are a vegan who breaks the rules, or are an equal opportunity eater, these almondy cookies are for you! Dairy-free and delicious. I adapted this recipe from one I found online a handful of years ago for a frosted sugar cookie. Ingredients changed, you know the drill... When freshly baked they have a beautiful dense chewy texture in the middle, and a delicate crispiness along the edges. The key to the lace is heating your pourable honey until it's significantly less viscous that it comes straight out of the jar. If you don't heat the honey the cookies will still be delicious, they just won't spread as much to create the lacy edges. Preheat the oven to 350 degrees. Combine all of your ingredients in a food processor, scraping down the sides as needed. Scoop tablespoon-sized balls of dough onto a heavyweight cookie sheet, spacing them at least a couple of inches apart. Bake for 5-10 minutes until the edges spread and show color, and the centers are beginning to firm. Let cool on the cookie sheet before serving. Here it is! My vegan (coconut) whipped cream! No crisp is complete without a cold creamy something to go alongside. But let's be honest. EVERYTHING tastes good with whipped cream. The problem is that vegan whipped cream is inherently challenging... read: whipped cream sans cream. A few years ago I made a pumpkin pie for Thanksgiving and was determined to make a vegan whipped cream that would trick everyone into thinking it was the real deal. Yes, this whipped cream does have a slight coconut flavor, but the texture is pretty great, and so far it has done a good job of convincing even the harshest of critics. As coconut milk does not absorb air the same way as heavy cream, I use agar agar flakes (obtained from algae) to thicken the cream without weighing it down. Carefully invert the can of coconut milk and remove the bottom (now top) with a can opener. Slowly pour the liquid into a small saucepan, making sure the separated coconut cream stays in the can (refrigeration separates the liquid from the cream and floats the cream to the top). Scoop the remaining cream out of the can into a bowl, and return the bowl to the fridge. Add the agar agar flakes to the saucepan. Heat the liquid on low, stirring regularly with a whisk until the flakes dissolve completely. Remove the cream from the fridge and pour the saucepan contents into the bowl of cream. Add the vanilla and agave. Whisk with an electric beater until thickened slightly. Return the bowl to the refrigerator, and chill for at least a few hours. The cream will continue to set up in the fridge, so don't be concerned that you don't get the desired texture after whipping the cream. Try to have patience while it sets up, and enjoy! The first post from my original food blog is the first post on Anne food. too! And it reads.. Here we go! My first real blog post. Right off the bat I'd like to thank everyone who has repeatedly suggested I start a food blog, because having people to share my cooking and recipes with makes them that much more satisfying! To celebrate finishing my portfolio and getting my website up and running, I thought it would be appropriate to kick this whole thing off with a sweet treat! One of my favorites, for which I always have the ingredients in my pantry: banana sundaes. Feel free to use whatever toppings you like such as fresh berries or chocolate sauce, this is just what I had on hand. Being allergic to cow dairy yet not willing to forgo the pleasure of creamy frozen desserts, I'm a big fan of making my own simple ice creams. An added bonus is that they are actually healthful! Cut the frozen banana in chunks and place them in the food processor. Turn it on and let it run for a few minutes, stopping periodically to scrape down the sides with a rubber spatula. At first the banana will look like a disaster, but will soon form smooth ice cream. Meanwhile toast the nuts and coconut flakes in the toaster oven at 350 degrees until lightly golden. Watch the coconut flakes like a hawk as they burn insanely quickly, and will be ready in a fraction of the time it takes the nuts. Spoon the ice cream into a bowl, garnish with your toppings, and dig in!